Finds a weasel in a box trap he’d set in hopes of catching animals for sustenance. Sam allows the weasel to come and go as it pleases. The weasel hangs around and Sam bestows on it the name Barron for its bold, confident demeanor. How cool. I wanted a weasel like that. We had a weasel living with us. But winter came, and neither of us had seen Chippy for quite some time. Occasionally in the early morning after a fresh snowfall, we’d see weasel tracks and although they could have belonged to any number of weasels (there is no shortage of them here in the village), we liked to imagine they were Chippy’s, evidence of happy nights spent chasing voles and other small creatures. The skull of a weasel. We’re very happy that our resident Great Horned Owls are making it through this unusually cold winter, but… Chippy, we hardly knew ye. 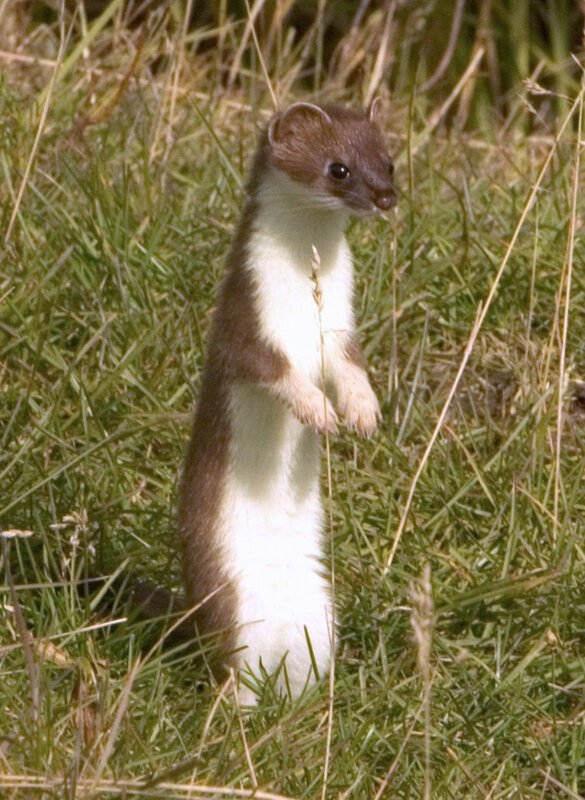 Also known as Stoats and Ermine, Long-tailed Weasels are related to otters, mink, martens and wolverines. Although they’re only about 10 inches long (25 cm) from nose to tail tip, like their biological cousins, they are fierce predators, sometimes preying on much larger animals. In winter, their fur becomes snow white except for the tip of their tail which remains black. Six years is a long life for a Short-tailed Weasel. *It is unlikely that the skull we found beneath the White Spruce Grove is actually Chippy’s – or that this is the only weasel Chignik Lake’s Great Horned Owls have dined on. ‡Fans of Shakespeare will recognize this passage from Hamlet’s musing on mortality as he holds in his hand the exhumed skull of a favorite court jester, Yorick. This is the first article for Wildlife Wednesday, a new column on Cutterlight. Stay tuned (or sign up) for weekly articles on birds, mammals, insects, wildflowers and more.